mainly made during Diwali, Naralipournima or festive season. In Maharashtrian karanji, the stuffing is made up of fresh coconut, jaggery and flavored with cardamom powder. You may use dry or desiccated coconut and sugar for a longer shelf-life. 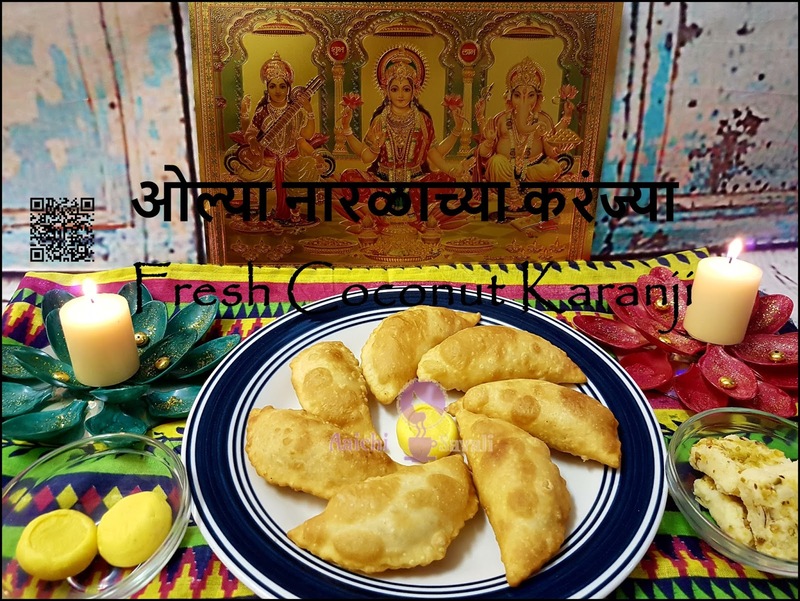 I like to making karanji using fresh coconut for superior taste; one can also make dry coconut and sugar stuffing too, that Karanji is known as Sukya khobryachi or Sarnachi (desiccated coconut) Karanji. 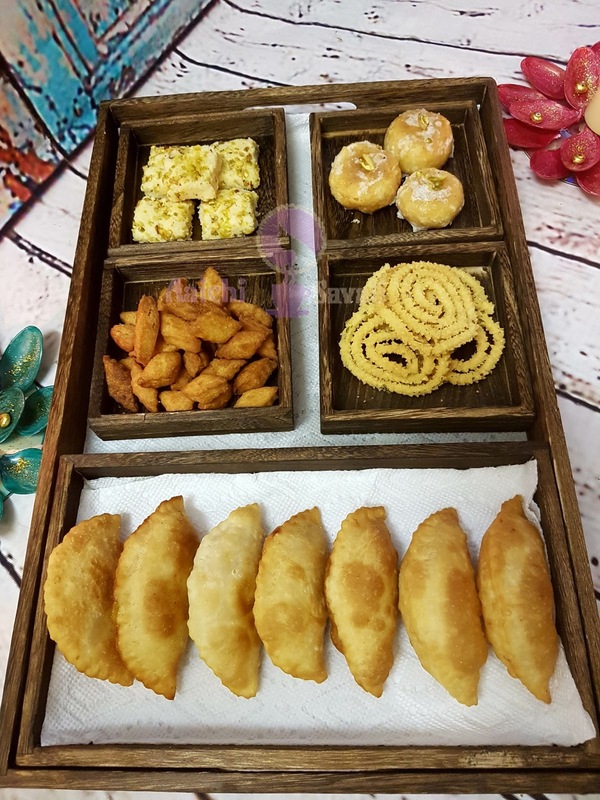 Karanji is also called as Gujiya in north India and which is stuffed with khoya or mawa, prepared during the festival of Holi. Fresh Coconut Karanji is one of the easiest recipes, do try preparing karanji this way and I am sure you will prepare more and more time. Preparation Time : 20 Minutes ; Cooking Time : 15 Minutes. 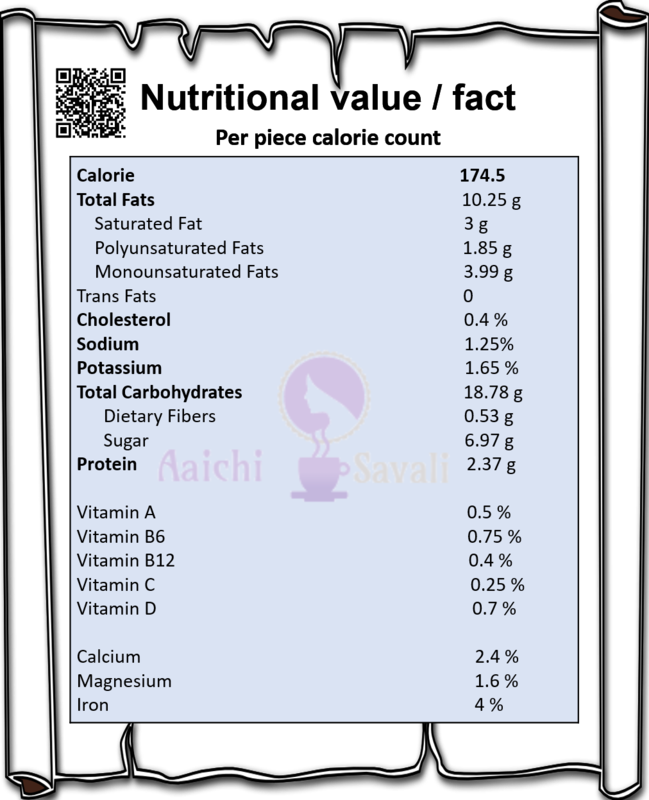 Each Karanji contains 174.5 cal. In a mixing bowl add all purpose flour, rava and pinch of salt and mix all well. Heat oil or ghee and add it to the flour mix and oil / ghee should evenly be mixed with the flour. Now, take milk (room temperature milk) using milk slowly start kneading the dough. The dough should be pliable but yet not as soft as for rotis. It should be a little hard. Keep the dough covered using a wet cloth for 1 to 2 hours. After 1 to 2 hours, knead the dough again slightly and make small round balls. 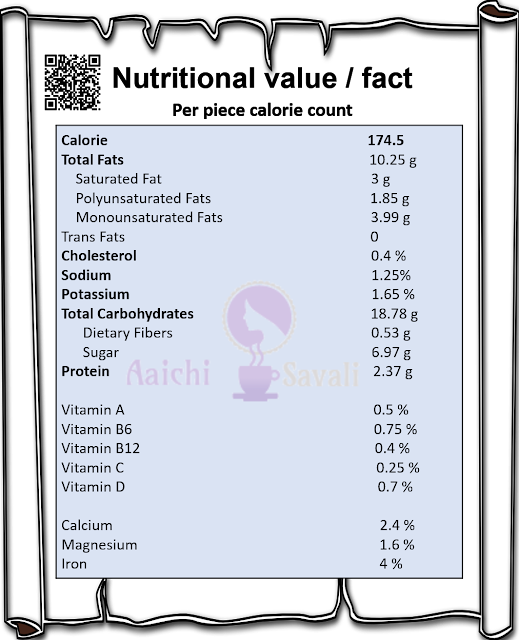 In a kadhai add ghee ½ tbsp, jaggery and coconut. Cook on low heat till all jaggery melts and the mixture comes together. Add cardamom powder and chopped dry fruits, continue to cook the mixture on low to medium flame and stir continuously. As it cooks the mixture starts to thicken and starts becoming tighter, once it is done turn off the heat and set aside. 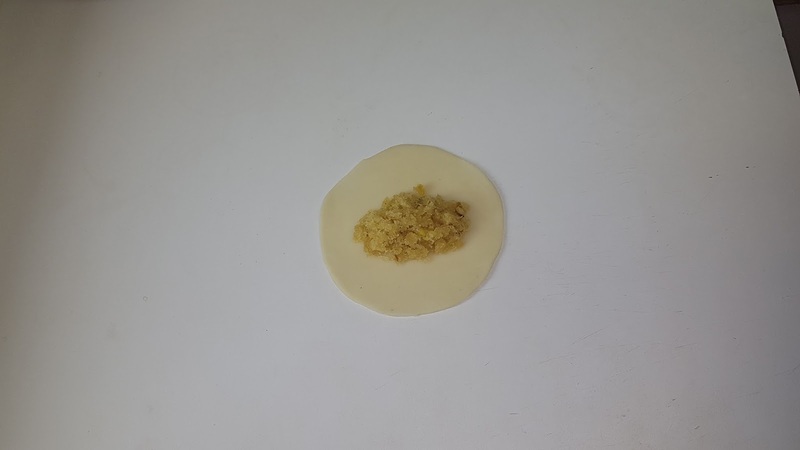 Take one small dough ball. With the help of a rolling pin, roll it flat (same as the size of a poori). Place a spoonful of the coconut jaggery stuffing in the centre. Dip your finger into the milk and apply on the edge of poori. Flip the other edge of the poori on to the edge to seal the filling inside. (Be sure that no air bubbles remain inside). Press the edges using the back of a designer fork, or if you are able to hand seal the Karanji the traditional way go ahead and seal it.Place the filled karanjis onto a wet towel to avoid drying. Cover the karanji flipping the other side of wet towel on top and continue this process for all karanjis. Heat oil for deep frying in a kadhai. Slowly fry the karanjis on low flame till golden brown. 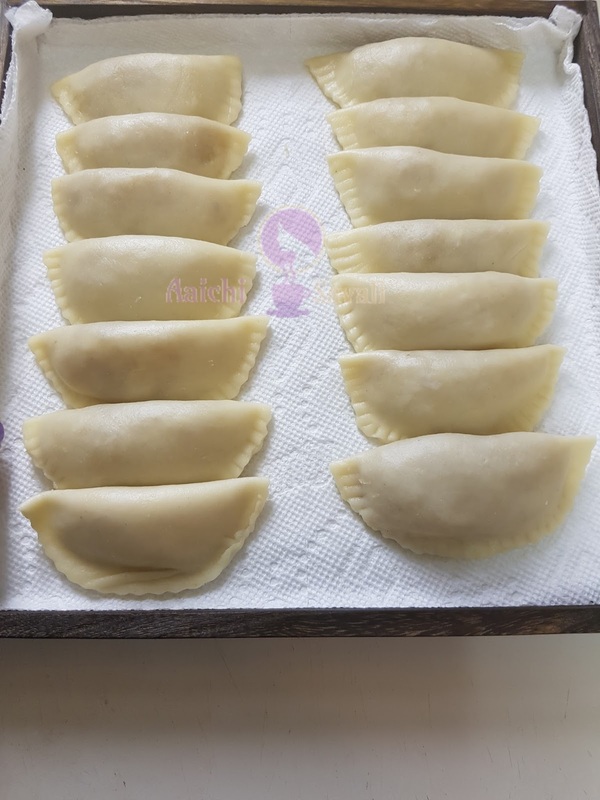 Remove on paper towel and let them rest for 20 mins. When cooled down, store in airtight container. Here, crispy outside, yet moist and yummy Karanjis are ready to serve. Enjoy!!! Jaggery and coconut both have the tendency to burn quickly, so do not stop stirring at any given point of time. The mixture shouldn't be runny and watery. While making dough add add boiled ghee, it will help to get crispy and crunchiness to karanji. While kneading dough add milk and sugar mixture little by little. While making Karanji the edges should be tightly sealed or the filling may ooze out during deep frying. Fry Karanji on low to medium flame only. Per serving contains 174.5 calories, along with carbohydrates - 18.78 g, fats - 10.25 g, proteins - 2.37 g.
It is good to eat Karanji as a snack. Jumping rope for 21 minutes will help to burn about 200 calories. It's my favorite too. Thank you so much for stopping by and such a nice comment ma'am. 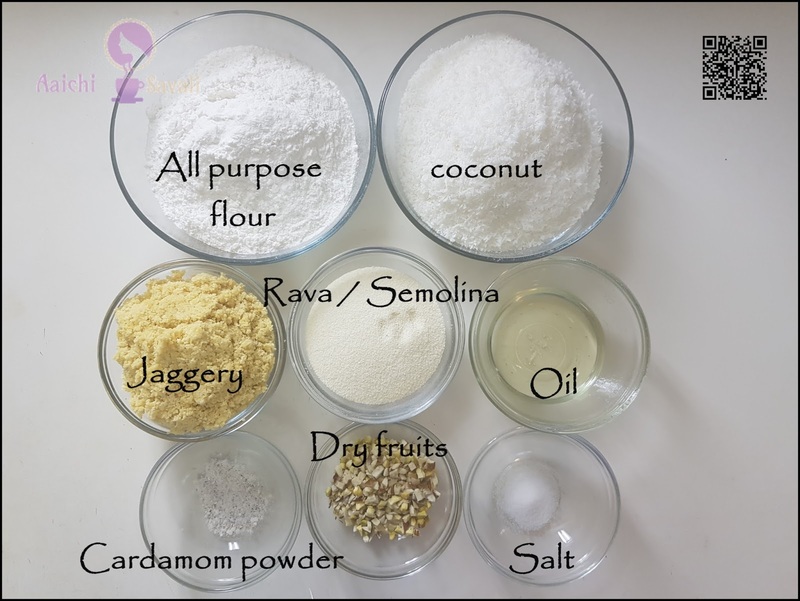 While using desiccated coconut add a little bit water to make them wet and then add it to semolina will make some difference and will give you a taste of fresh coconut. I hope it will help you.